Seu Bi was born into a fishing family and has been a fisherman his entire life. 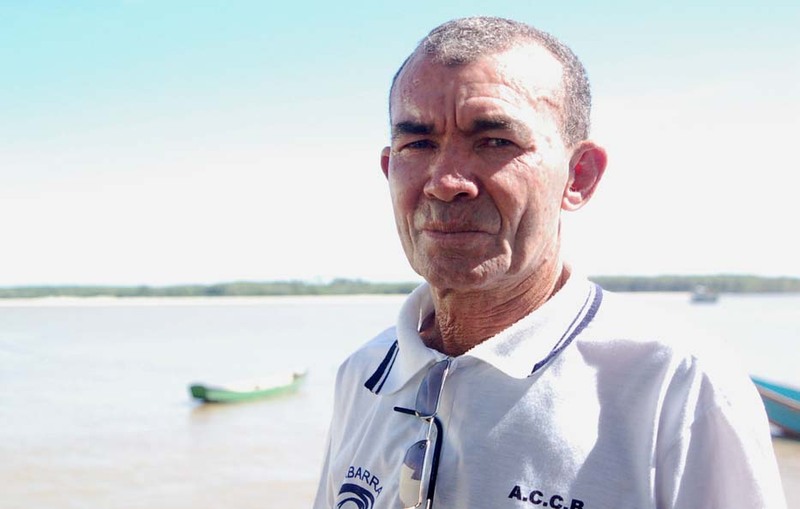 He is the President of the Mariculture Association of Conceição de Barra (Associação dos Maricultores de Conceição de Barra – AMABARRA) and Director of the Shrimpers Association of Conceição de Barra (Associação dos Camaroneiros de Conceição da Barra – ACCB). Over the last five years Seu Bi has received death threats for his continued work in protecting the rights of local fishers. His entire family left the region to seek safety but Seu Bi is committed to staying in the region. “In Conceicao da Barra 75% of the municipality is covered by eucalyptus and sugarcane. These companies deforested and destroyed the water springs and still put their poisons in the rivers. The sea, rivers and mangroves continue to suffer a widespread exploitation by Petrobras. As a kid I fished with my father by canoe and watched Petrobras blasting dynamite across the sea for oil exploration, thus the decline of fishstocks. Our production has fallen over the past 20 years and has reduced our fishstocks by 60%. What will be our future with this model of government we have?